As winter crawls into view, the weather keeping some of the unfriendlier temperatures at bay, golfers begin to reconsider their golfing priorities. Some reach for the woollen jumpers, the bobble hats and hand warmers; others reach for the remote having allowed their clubs to slip quietly into hibernation. Golf clubs around the country know that their green fee income will be dropping drastically in the coming months. And, to be fair, courses prone to frost and heavy downpours could do with a lighter footfall - to protect the course and to allow the greenskeepers to get out and implement maintenance programmes. But clubs still run particular events and competitions to keep things ticking over, and they start promoting rates and packages for next year as well. One such club is the Ballesteros course at The Heritage. 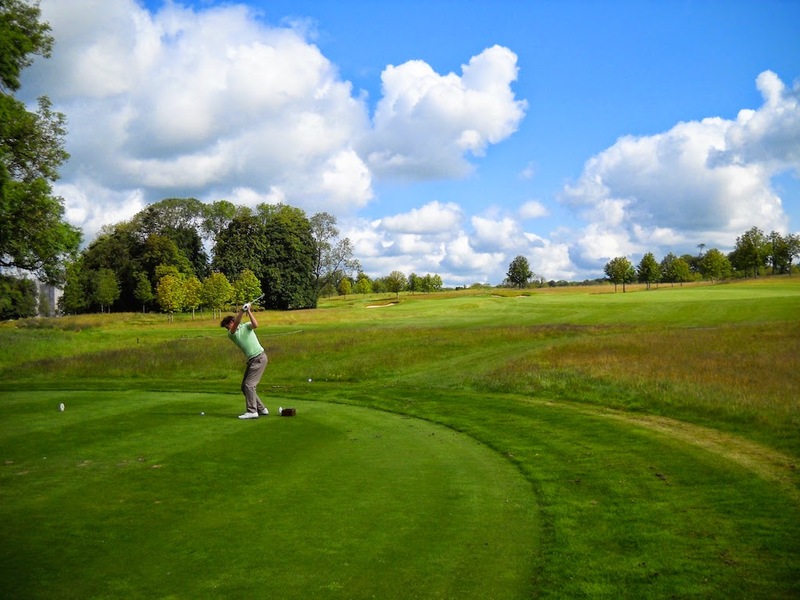 Another golf course rankings hit the shelves with Golf Monthly’s 2015 Top 100 list. 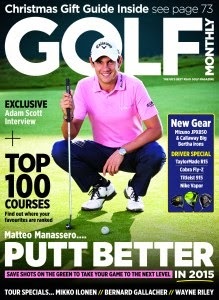 The magazine proudly claims that it is a list produced by golfers for golfers. Fair enough – you can’t say simpler than that. Do you dare play with perfection? Do you take a beautiful woman and inject some botox? Do you take the Mona Lisa and add a fresh lick of paint? 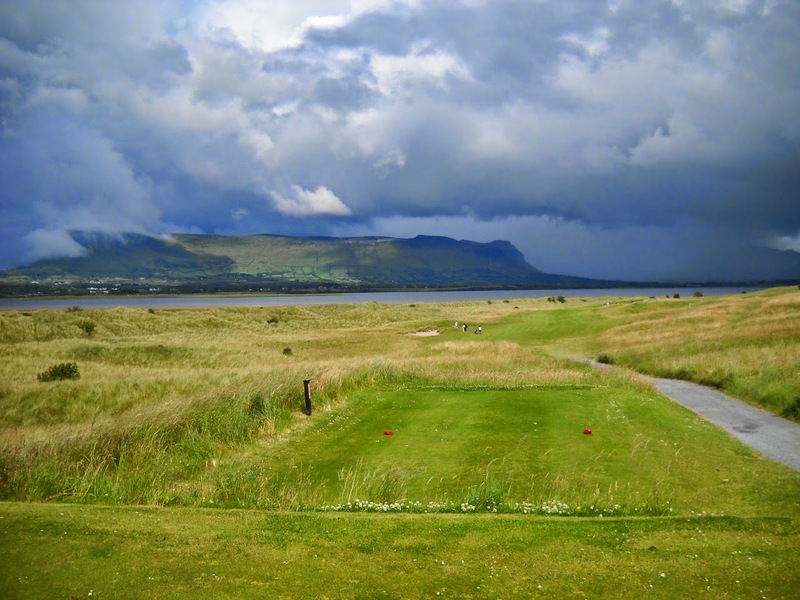 County Sligo is one of the finest links courses in Ireland... perhaps anywhere... but now change is afoot. Is a Hole in One Worth It? A friend of mine got a hole in one (his first) a few weeks ago... he got a pat on the back and twice what he would have received if he'd scored a two. That's the way it works in our club. The trouble is, the twos pot rarely delivers more than €10 per two and, on this occasion, my friend earned himself €18, i.e. two X €9... for a hole in one! Yesterday, that same friend got a two... for which he received €23. A hole in one deserves something extra... say half the twos pot... or a special presentation... just something to reward a singularly brilliant shot*. And let's not forget all the drinks you have to buy with that hole in one... even if you have the insurance. * Assuming it's a brilliant shot and not some brute of a thing. Irish golf was always going to be rewarded at the inaugural World Golf Awards, held in the Algarve this week. 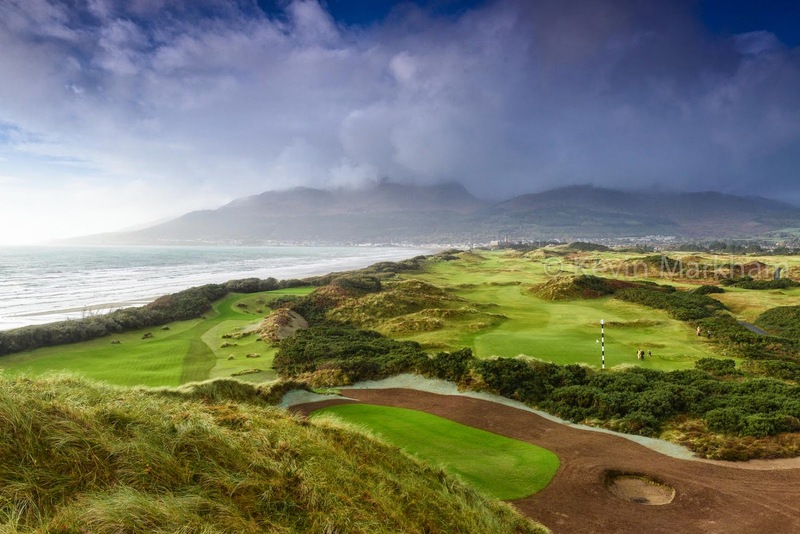 The two big winners were Waterville – awarded the title of country’s best golf course for 2014 – and the K Club, which received the award for Ireland best golf hotel. 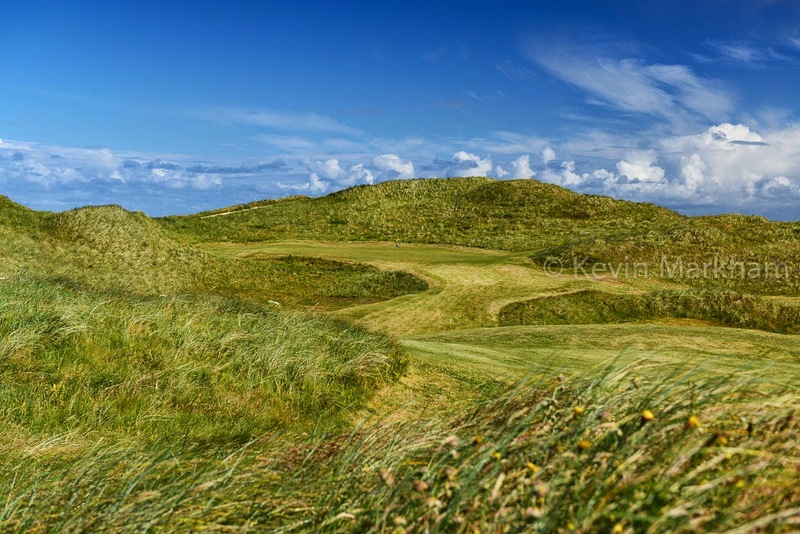 In Northern Ireland, Royal County Down received the best course, while Lough Erne collected the best golf hotel award. Everyone has their opinions. What a dull place it would be if we didn’t. 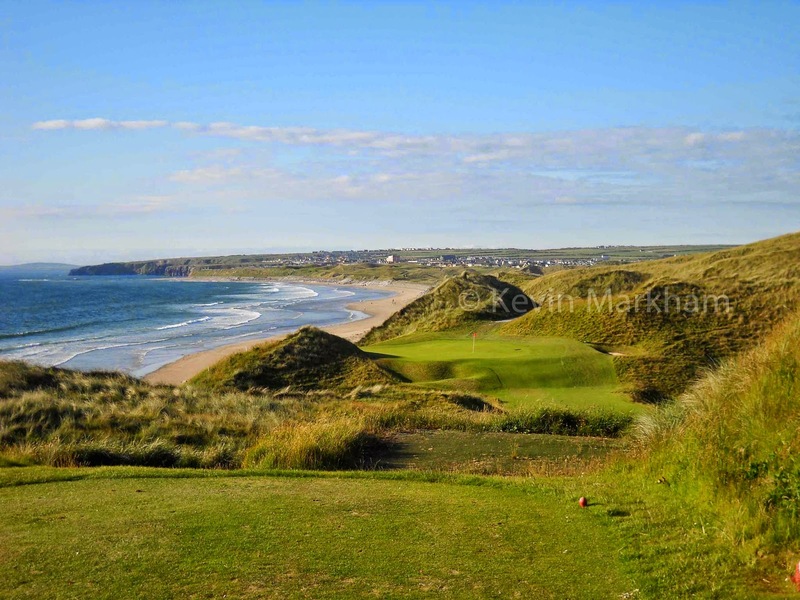 Failte Ireland, in its guise as The Wild Atlantic Way, has produced a list of the top 18 golf holes along the 2,500 km route that stretches from Cork to Donegal. The list was produced for them by In The Company of Huskies, a Dublin digital agency. 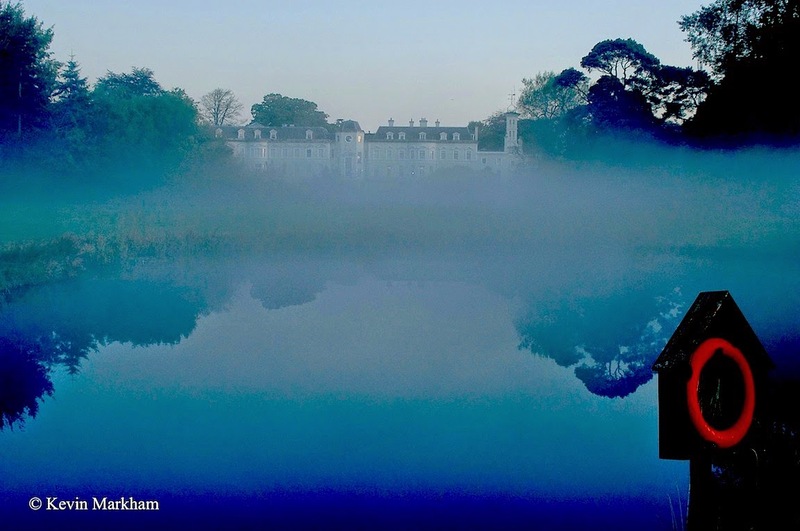 The Wild Atlantic Way is Ireland’s new holy grail of tourism, showing off the beauty of Ireland. You’d think the goal would be to pick 18 holes that show off the beauty of the golf courses’ surroundings. Perhaps this will pique your interest if you're wondering how best to treat some clients in the run up to Christmas. It will also appeal to regular golfers, who fancy the opportunity of meeting the Ryder Cup Captain and all Ireland hero, but the price may be somewhat off-putting. No, I think it's fair to say that this is a bit of a back-slapping 'thanks-for-all-your-business-this-year' kind of do. And, around Christmas time, that might be the perfect way to cement your business relationship for 2015. 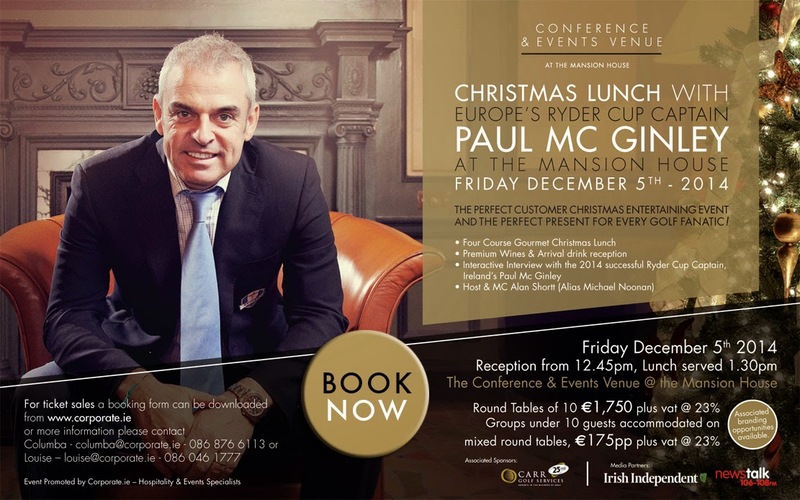 On December 5th, a Christmas Lunch will be held at Dublin's Mansion House (on Dawson Street), with Paul McGinley in attendance. There will be a four course gourmet lunch, wine and an interactive Q&A with the man himself. The price for a table of 10 is €1,750 (excl. VAT), but you can buy individual tickets if you don't have that many clients, you don't have that many clients you actually like, or you feel like being stingy. All the information you need is on the poster above. Contact Louise or Columba on 01 676 7200. Irish golf job positions don't come along that often - certainly not at the moment - so here are some seriously interesting ones from the Confederation of Golf in Ireland (CGI). The CGI was created by the GUI, ILGU and the PGA to help advance the sport of golf in Ireland, and today they're looking for at least two Business Development Officers. The successful job holder will provide dedicated business support to Golf Clubs throughout the Island of Ireland which will cover the following support areas: club strategy and business plans, financial, compliance, marketing, club membership, training, health & safety. The job holder will have a good understanding of business issues and be seen by others as having a deep level of commercial acumen. It is expected that the job holder will be solutions oriented, provide sound strategic advice to clubs and be able to determine what a golf club should do now to bring about a more profitable and successful future. ‘Festival of Golf’ at the Ballsbridge Hotel. A Recap. Two interesting things happened during the ‘Festival of Golf’ at the Ballsbridge Hotel, on Tuesday night. There were two holes-in-one on the famous 17th at Sawgrass, and I encountered a woman whose claim to fame was that Padraig Harrington had slept in her bed. I also learned that – quite possibly – the apple pie for which Mrs Ruddy of The European Golf Club is renowned, might… just might… be improved through the inclusion of cheddar cheese. It was an entertaining evening, for sure. In case you'd forgotten - the Dublin Festival of Golf Night is on tonight, 5pm-9pm, at the Ballsbridge Hotel. For full details, here's the earlier blog. 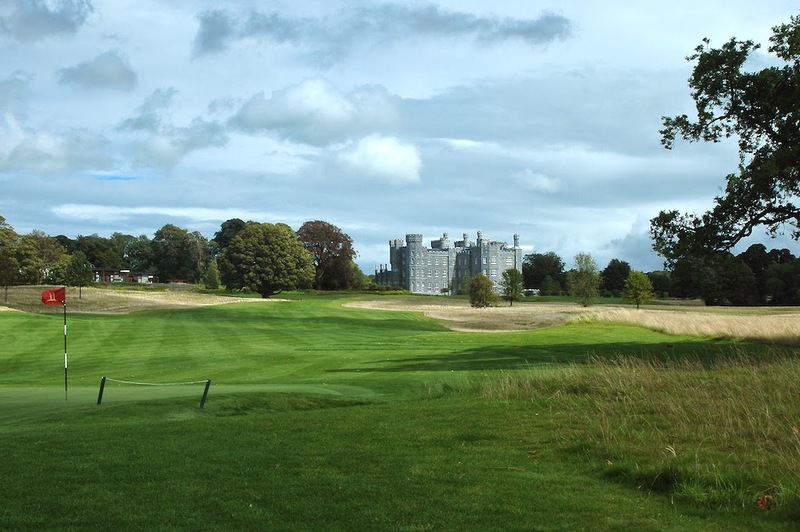 I was giving away a four ball worth €300 to Killeen Castle to someone who correctly guessed that there are 7 'castle' named Irish golf courses attending the event. The winner was Gary Hayes. Gary, here are a couple of pics to whet the appetite. 9th green at the foot of the dune. Given the state of the country today, there are not many Irish golf courses investing in new holes. Carne completed the Kilmore nine last year – for the remarkable cost of just €200,000. Rossmore added two new holes and a reworked routing. Roe Park, outside Limavady, has added three new holes – although ultimately, these will be for practice purposes. Rathfarnham is busy revamping three of its existing 15 holes, while also building three new holes to bring it from a 15 to an 18 hole course. 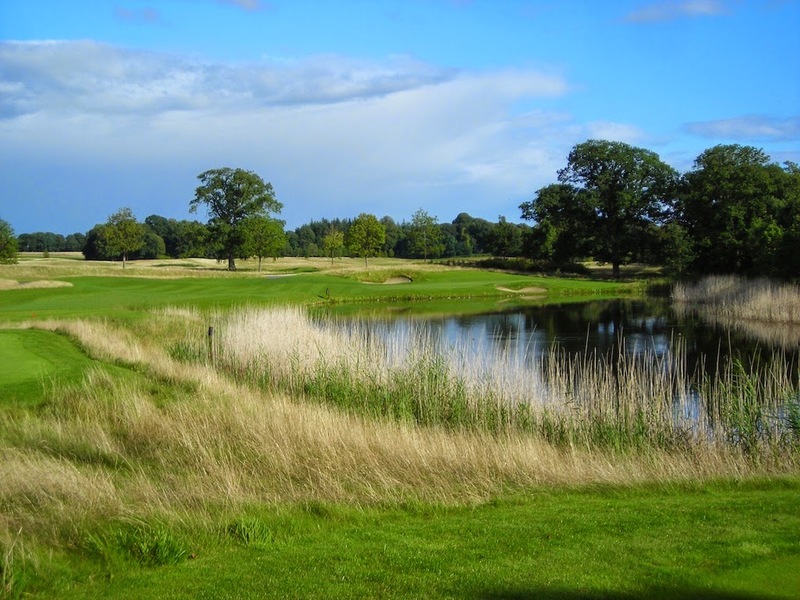 South Meath has added nine new holes, as has Mountbellew, but both of these courses are on a lower tier to the ones mentioned above and the ‘attention to detail’ is not so precise. That cannot be said of Royal County Down (RCD).